I suspect this site will become famous in the on-coming years for the most accessible area to see the Unicolored Thrush. Important history here, There have been no secure observations of the Unicolored Thrush for gone many years (decades in fact). It was not until Dan Lane, guiding for Field Guides, found the species in Beni Savanna Varzea (seasonally flooded forest) habitat in 2010. Once he pinned the habitat niche, further researchers found another site for the species down Rio Mamoré. 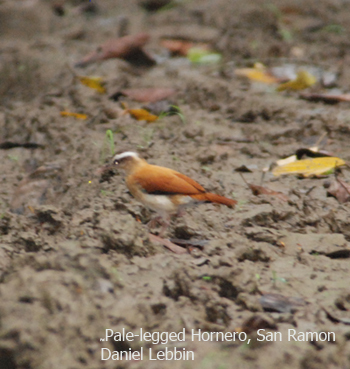 And that led to Frank E. Rheindt confirming the Unicolored Thrush in the San Ramon Varzea Forest in December 2011. So, kudos to Dan for ground truthing the Beni and finding the species, and to Frank for finding the seldom seen Bolivian Endemic fifteen minutes from Trinidad City. I visited the site in April 2012, and did not find the species, but did find the road to the varzea forest flooded, which makes a lot of sense at the end of the rainy season. This is also a poor time of year for playback response. In the area I found Beni Softails (study their distinct sounds), Pale-legged Horneros and Plush-crested Jays. Beni Grackles should be in the area. I also visited the site of Puerto Ballivian where Beni Softails and Grackles were present, and there is a trail travelling through perfect Varzea forest. I only spent a few hours in the afternoon at the site. Please let me know if you find the Unicolored Thrush and any other species of interest. Take the road (Carretera) a Loma Suarez. This paved road travels South-west from Trinidad city, passing the entrance to the airport. Follow the road, where you will pass on the left an access road to Puerto Ballivian. Continue passed the Suerez military complex to the port town of San Ramon. At San Ramon there is a dirt road that travels beside the river, on your right as you arrive, travelling north (with the current of the river) into disturbed Varzea forest. This is the promising Varzea forest. Also try Puerto Ballivian. From the carretera a Loma Suerez, the access road to Puerto Ballivian is the first paved road on the left. As you arrive to the town, turn left (south) following the river downstream to the restaurant “Pascana Turistica.” Just to the left of the restaurant is a varzea forested trail which travels south following the river edge. This area looked very promising for the Unicolored Thrush- but was mostly flooded on my visit. Vargas Rent-a-car knows these sites.